Overall, we like what Mio Shrink To Fit Cellulite Smoother did to our skin and the appearance of our cellulite. The short term results in particular were very good. It obviously didn’t make our cellulite “disappear”, but it did make our skin much smoother and softer. The only things we didn’t like with this one were the smell and the too-small bottle. It kind of smells like cough syrup and the small bottle won’t last you very long. But overall, this is a very good cellulite cream with really good ingredients! Mio Shrink To Fit Cellulite Smoother comes out of the pump tube as a thick, opaque-colored gel. It feels fairly slick although it’s a bit “clumpy” if that makes sense. Due to it’s texture and thickness, applying this one takes a little bit of work. It’s nothing major, but blending it in takes a few minutes per area. Mio Shrink To Fit Cellulite Smoother dried pretty quickly compared to other cellulite creams we’ve tried. Within a few minutes, I felt like it was almost completely dry. Kudos for that as there’s nothing worse than that wet, sticky feeling! Similar to many other cellulite creams, Mio has that real strong menthol and citrus smell. If you like that smell, more power to you. It kind of smells like cough syrup as well– so we’re not really fans of the smell. After a few hours, the unpleasant smell of this one had dissipated quite bit. It was still noticeable, but nothing like when we first put it on. We loved the short term results we got with Mio Shrink To Fit Cellulite Smoother! It left our skin feeling very smooth and supple. You could actually see and feel a difference relatively quickly. Longer term Mio produces really good results. The areas we used this on got smoother, softer and just appeared “healthier”. Shrink To Fit contains 33 ingredients, which is a good number in our opinion (not too many, but enough to be effective). 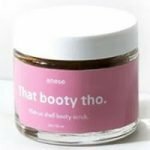 It’s also got a combination of traditional “cellulite-fighters” like caffeine and green tea as well as a few more “advanced” ingredients. One of these is Adiposlim, which is a patented combination of sorbitan laurate and lauroyl proline. Studies have shown this combination improves the fuunctioning of cells and enhances blood flow. Two important things to help minimize the appearance of cellulite! The cost for this one is $56.00 for a tiny 3.4 oz bottle. That works out to $16.47 per ounce, which is on the pricey side. It’s a shame but Mio Shrink To Fit really doesn’t come with any guarantee. We obviously prefer that cellulite cream companies offer an unconditional money back guarantee. To buy Mio Shrink To Fit Cellulite Smoother, click here.